We are all jubilant about the crude prices have come down to $85 and it’s expected to come further below as per reports of the big giants of the world market. But I find the crude prices to shoot up to $100 by December and $120 by March 2015. Low crude prices theory is based upon that Europe, US and China are under the phase of slow down and hence there is not much demand as compared to the productivity. Well these theories are good for academics but not for intelligent animals. Low crude prices are no doubt beneficial to the Emerging economies who are importer of crude like India. Surplus funds from low crude prices leads to investments in progressive segments but the game is for a very short lived phase. Many people have now thrown the question on RBI about cutting down interest rates as crude prices are low and hence fiscal deficit is coming down further Indian economy is entering into the proper channel of FRBM .I find RBI has negligible position for cutting down interest rates. We must not forget that THE collapse of the Soviet Union in 1991 had many causes but the prime among them was the fall in the price of oil, its main export, by two-thirds in real terms between 1980 and 1986. Iraq, Syria, Nigeria and Libya, oil producers all, are in turmoil as the price of Brent crude fell over 25% from $115 a barrel in mid-July to under $85 in mid-October. Venezuela’s-Every dollar off the price of a barrel cuts roughly $450m-500m off export earnings. By Deutsche Bank’s calculation, the government needs oil at $120 a barrel to finance its spending plans—higher than before the recent tumble. Hence its well clear that world economy would be facing more slowdown if the prices of crude falls to below $85 level. Now the cold war between Russia and US is now quite visible. US is playing with crude since its increasing its production so as replace the entire middle east by 2018 and that to save the dollar from getting replaced as a reserve or trading currency in the coming years. It’s a threat for which US is aggressively producing crude. China and Russia are doing internal trades based on their own currency and avoiding dollar. Now we all know that Russia exports crude in exchange of food items and other necessary consumption based items. Now with the present level of crude of $85 leads a significant threat to the economy in the long term. Moreover with winter season in Russia creates huge market of demand for food and other consumption items. Hence Russia would find intense difficulty. Sovereign funds size of the Middle East and Arab world in terms of exporting of crude has swollen to a mammoth level. This is a threat for the US and European economy as the biggest question of funding of various militants group is question of trillion dollars. For me this is an assumption and the best reply for the same lies with my readers. The most astonishing part is that Libya has started production of crude despite of so many tension raises the eye brows of billions. Libya would somehow be pumping 40% more oil at the end of September than it had just a month earlier? Supply rises by 810,000 bpd, led by Libya On the other hand Saudi Arabia’s decision to boost output to protect its market share and hurt American shale producers and see off new developments in the Arctic was also a big shocker. Further Russia has aggressive planning for its military and defense and the funding of the same is dependent on the crude export at the price of $130. We Indian needs huge amount of storage facilities where cheap[ crude can be stored and can be consumed later on which will also give the biggest advantage to the Indian economy when crude prices increases in the international market where as India could enjoy a low price particularly for the agricultural sector. We need to plan storage facilities and develop alternative energy for the agriculture sector so that we can get out of the clutches of the crude prices. The recent report of the big cats of the world market that crude prices can come down to the level of $75 has been said since in the US, the weighted average marginal cost of crude production at the shale-dominated onshore plays is about $73/b. Hence they are not making a loss. Further the report have been released since they want the world market to create massive short position in the near term and make zoom up rally in the long term something which happened to gold during Feb-2013. Another big winner, paradoxically, will be the U.S. oil industry. Fears that the price plunge will force cutbacks in production appear very premature. In fact, if Congress gets its act together and lifts its forty-year old ban on oil exports, we could actually see a spurt in production. The other big winner will be the U.S. consumer. Americans are already seeing the impact at the pump, with gas prices averaging $3 a gallon. If the price of Brent crude falls to 80 dollars a barrel, that’s the equivalent of a $600 annual rebate for every American household and a $1.8 billion daily windfall for the world economy. US economy will face slowdown and Europe too but do you think that Indian markets and economy would grow particular the ones who are dependent on export. Moreover these developed economies knows very well that if crude prices goes up to the level of $120 then inflation will swell and interest rates would not come down and rupee as well as economic growth will be under intense pressure to grow. Hence the best way to create problems for this new government and economy is crude prices. Hence its quite easy to derail the growth plan of the present government and bring slow down. This is why we need huge storage facility and also intensive growth for alternative energy particularly to the solar sector. This month's output is OPEC's highest since November 2012 when it pumped 31.06 million bpd, according to Reuters surveys. Involuntary outages, such as in Libya, kept output below OPEC's nominal 30 million bpd target in earlier months of the year. Iraq, like Libya, has also managed to increase supplies despite fighting in the country. Oil output rebounded due to higher exports from Iraq's southern terminals and increased output from fields in Kurdistan. An advance by Islamic State fighters nearby crude wells is an significant threat for the crude to grow. After reading the affects about the losers due to the falling crude prices do you think that they will remain silent’s and will not do anything where crude will shoot up to the level of $120. A return to sub $100/b oil also comes as oil executives confront growing investor calls for more capital discipline to defend revenues against ballooning oilfield service bills. Creeping industry costs and fast-growing costs of accessing more remote, complex sources of oil and gas and have played a key role pushing breakeven costs perilously close to current oil prices. The London-based group said that collectively, the world’s oil majors are looking at a potential capital spend of $548 billion over the period 2014-2025 on projects that require a market price of at least $95/b. Hence if oil companies start losing billions then unemployment would increase which will create massive prolonged slow down. Do you think that these exporting economies would afford that at the cost of low crude prices? The battle is now between US and Russia and Middle East countries who export crude. This is further proved from the latest US air strikes in Syria targeted oil facilities controlled by Islamic State (Isis) in a deliberate attempt to wipe out a lucrative source of income for the rapidly expanding jihadist group. The Islamic State, which now controls an area of Iraq and Syria larger than the U.K., may be raising more than $2 million a day in revenue from oil sales, extortion, taxes and smuggling, according to U.S. intelligence officials and anti-terrorism finance experts. The Islamic State is probably the wealthiest terrorist group we’ve ever known,” said Matthew Levitt, a former U.S. Treasury terrorism and financial intelligence official who now are director of the counter terrorism and intelligence program at the Washington Institute for Near East Policy. Hence that’s the reason why crude prices are coming down but the biggest question is that how long the price will be falling. The war for Crude is cruel and I fear India should not get burnt. That’s the reason I am focusing and urging more on increasing the storage facility of India for crude. According to the Iraq Energy Institute, an independent, nonprofit policy organization focused on Iraq’s energy sector, the army of radical Islamists controls production of 30,000 barrels of oil a day in Iraq and 50,000 barrels in Syria.By selling the oil on the black market at a discounted price of $40 per barrel (compared to about $93 per barrel in the free market), ISIS takes in $3.2 million a day. My point is that why we should get into this problem and why not aggressive look for freeing up the agri-sector from the dependency of oil and focus on solar power.US is squeezing up Russia and Middle East so as to cut down the funding. Now do you think that RBI will cut down interest rates and take the hit later for rising crude prices? We should build huge reserves/storage of crude at these low levels and also work hard to develop solar power energy based energy supply for agri-sector to control the affect of rising crude prices.Also remember that what ever losses happens today will be coped up in the long term.So their is less space to smile. The Indian manufacturing segment is on the path of massive revolution where ‘Make In India’ is being invited. In my research I find some socio economic areas where improvement and cautious approach is required to be adopted by the Business Chambers of Commerce and also by the Indian government and regulatory system. We are inviting FDI investments and investors to open shops here. We are proud to invite but how much trust the business houses like CII,FICCI, ASSOCHAM has in these initiatives. Since they have been the biggest suffers over the last 5 years in terms of policy actions. We are not criticizing the concept or the dream but we have a long way to go and achieve the same. We are indirectly asking FDI to create India as an exporting hub. But, how well we are prepared for an instant flow of the FDI’s in India. We are not discussing about infrastructure growth but we are discussing about other prime socio-economic factors which will support in real terms for Make In India. Hence the above data cleanly states that in order to Make In India successful we need to climb down many steps down. Manufacturing segment faces the biggest problem of labour Union and Power shortages. Last year in a research by FICCI it was found that over the last 2 years deficit of electricity have been 15% of the peak levels which translates into a loss of $64 billions to the economy. India has installed capacity of 250 Giga watts but produces only 160 GW. The recent coal scam and the Supreme Court verdicts create stupendous problems for the manufacturing base to grow in India. Its easier to dream and think but we don’t have the basic infrastructure to support the same. Now the biggest hurdle will begin and this Make In India would turn out to be sour when infrastructure as well as FDI investors opens their shops simultaneously and policy delays and setup delays creates problems for the rest. We must remember that initially their will be some peanut investors who would come to India to taste the waters. Once they found the water is full of salt rest of them will stay offshore and the Dream will end up somewhere and will become a strong point for the opposition party of BJP in the near term. Law and order is one of the key areas where every state should come up together to make this Make in India initiative to be successful. We must remember that we have already witnessed TATA NANO –Singur matter and hence efficient system and stringent measures should be implemented so that these type of things don’t happen which damages the scope of the Make in India to grow. One of the most important things is that we are inviting FDI investors for opening manufacturing base in india but where they will open their shops and what type of facilities would be promoted by the state governments. We have 29 states in India currently and hence we need joint effort by every state-politicians to come together to create this Make In India. But we have found in history that every state competes with each other due to so many regional political parties holding key position of individual’s states. The game of bribery and manipulation starting from land deals etc begins from these state level competitions. We need joint effort and equivalent facilities being provided by every state and not providing any scope of exploitation. Now coming to the labour reforms and policies have been totally in jeopardize over the last 60 years. The recent case of Maruti is enough to say about my thoughts. The Trade Unions played extensively their political game and many politicians have come from being only an illiterate Trade Union fellow who was active in fighting and creating problems with promoters of the company. The Indian economy has a plethora of examples where managers/employees have been burnt to death in the hands of the Trade Unions. We need labour laws which will not be cheap proposition for using the labour as well as the labours would not take things for granted. There is requirement of flexibility and every state should understand this concept. 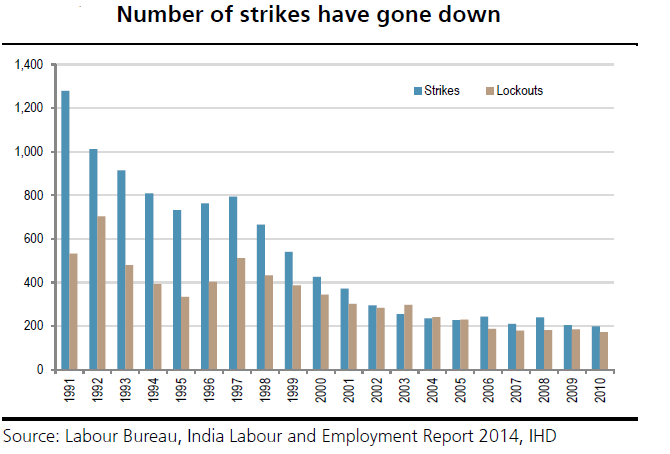 If we look at the historic pattern of lock outs and strikes we find impreesive numbers currently but still lot needs to be done. India's labour laws have continued to be cited as "archaic" or regressive and they are many –44 different laws on labour at the central government level, often with contradictions. In my research I find that Central Government rules and regulations have little scope to play here and much of the responsibility of the labour laws is in the hands of State Government. Just take the example of West Bengal which just got ruined in the hands of the trade unions over the last 3 decades in the hands of the CPIM through these trade unions. Every business and Industry were compelled to exit the state and get into some peaceful state. If someone says that Gujarat, Hyderabad , Banaglore has grown phenomenally then one must remember that their trade union policies were flexible and were well controlled. On the other hand state government has taken some active steps to improvise the labour reforms police which would create significant growth of these states in the long term. There have also been cases where respective state government has made the law more stringent, for example West Bengal. Such states, where laws are more rigid, have done relatively poorly. The need of the hour of this decade is that we need flexible labour laws and friendly for both the players. We need zero politics to be mingled in these policies. We must understand that today the citizens of India are more literate and we need to stop think for our vote banks biased approaches. If you want India to be an exporting hub for the global world then we need flexible, unbiased and friendly labour policies. Schemes like NREAGS were all created since there was lacks of skill development and technical education level where the huge manpower/labour could be utilized for manufacturing base. If there were more focus towards skill developments and asking the NGO’s that one NGO will get taxation benefits only when he is a part of Skill development then this should have created a well sustainable labour force over the long term. I used the NGO over here since they have more rural presence than any other segment across India. The government has a target of skilling more than 500mn people by 2022, aided by the National Skills Development Corporation (NSDC), which has been given the objective of skilling 150mn by 2022, and rest through various ministries. Of this, 50mn is targeted in the 12th 5-year plan. NSDC is a Public-Private Partnership (PPP) which acts as a catalyst in skill development by providing funding at low rates(grants, equity, soft loans) to enterprises/companies/organisations (skilling partners) that provide skill training. The skilling programs are developed in consultation with the industry. The above data clearly shows that we need chain of actions for the skill developments and hence we need PPP models to come active in skill development. 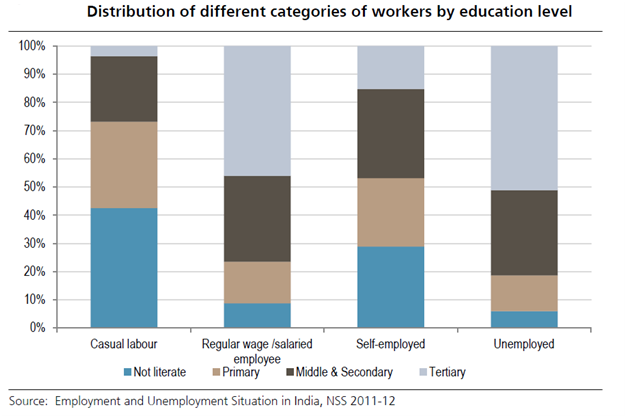 On the other hand its being found that always whenever there is some growth of the Indian economy there has been a wide disparity of income between the labour force and the capitalist. Well what I want to focus is that the pay structure of the labour force should be compensated adequately and skill based and education/training lead compensation should be the key parameter for labour pay in any manufacturing base. It true that Indian labour cost is cheap but don’t make it so cheap that trade unions gets a ground to play and some foul people become politicians over the next 5 years. Complicated Trade Unions rules and regulation, leads to small attraction of manpower of less than 10 workers/employees SME segment. SME segment is one of the fragile sectors and hence they are the key long term economic powers but this power is very much scared of Indian labour laws. Further complicated inspection and various regulatory aspects create more fear and hence schemes like NREAGS comes into play. We are promoting exports indirectly through Make In India. If India needs to be global manufacturing hub then we need reforms not only on infrastructure but also in our minds sets and approaches. We need to upgrade the skills and education levels of the manpower of India. We need continuous supply of resources which will keep the manufacturing alive. We need negligible biased approach of the state government and also in-depth co-operation of making make in India to be successful. We need state governments to come forward and look for the long term benefit of the Indian economy rather than competing within 29 states. Remember that India adds 12mn people to labour force every year. Job creation statistics from the NSSO (National Sample Survey Organisation), and cited by the BJP (party leading current Government), show that between 2004 and 2012, India created 15mn jobs. This was much lower vs c.60mn jobs created during FY00-05. Hence we have a long way to go and we don’t want that Make in India goes for a wild toss. In my next article will cover the impact of Cost Audit and Costing methods removals on the Make In India dream. In continuation to my previous research articles I have found that over the next 2 to 3 years the recession of the World Economy WILL COME BACK AGAIN. Well today’s article might ask you to two things to do either to believe or not believe the facts, factual and analysis. Many of my readers must be aware that whenever there is any form of QE particularly to printing of money into the system, a country has to pledge and balance its Gold Reserves. Now let reminded of one of the incidents of last year’s where Germany the economy struggling with growth and employment requested US to give back its pledged gold of 674 tons gold from the New York Fed and the French Central Bank. Germany got only 5%of the Gold of 37 tons and US said that they will pay back the rest over the next 8 years. This means that US don’t have the gold which have been pledged to them and they will take 8 years to pay back the same. The below two videos are sufficient enough to disclose the rest of the story. Now the irony of the story is that suddenly In June 2014, however, according to a Bloomberg news report, Germany suddenly dropped its gold repatriation request. “The Americans are taking good care of our gold,” said Norbert Barthle, the budget spokesman for Germany’s Christian Democratic Party. Now I request my readers to find out the rationales behind the same action. While doing my research I find that Gold prices came down last year and their was a dramatic fall of the price during H1 of 2013(calendar year). Indian government –UPA II raised the voice that import of Gold was happening more and hence the country is facing the problem of high fiscal deficit. The Indian government banned import of Gold and the prices also came down. Well all these were planned by US since if the prices came down due to demand control then for US it would be easy to buy the Gold at low prices and build the reserves and payback the same. Further Fed doesn’t like rising gold prices as they have a psychological impact that undermines the value of and confidence in the dollar. Hence its well clear that for some other economy India and its political system played the game with Economy and market. Its also increased the smuggled gold market during that time. GOLD import part in Indian import % is very low as compared to other products particularly through the window of reverse taxation where as individual spare parts import has taxation where as import of the final product don’t have any such high taxation. Now just imagine the electronic and mobile phone market which has grown in India and the import of the same. Coal and other raw material import have been on the highest slab after the ban of coal blocks. Now this also validates the economic data which was manipulated by the Indian Government under the UPA-II regime in order to satisfy the US economy. US did naked short selling and made double profits during H1 2013 when gold prices went for a wild toss. I would like to give few of the examples of Naked short selling which were executed by the US and its top players which I also covered briefly in my last year article http://www.ianalysis.co.in/2013/04/goldbillions-made.html. 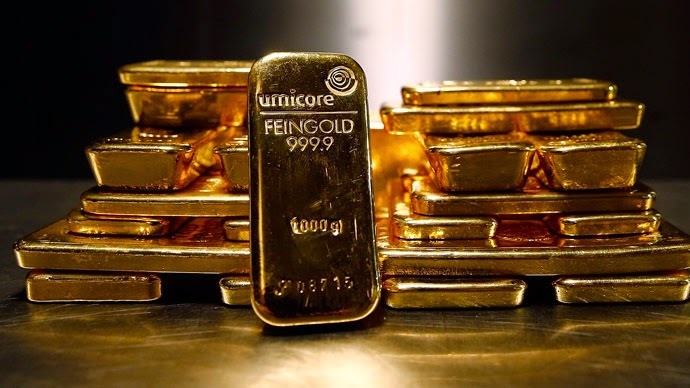 A couple of short news being spread are as follows In February, Credit Suisse ‘predicted’ that the gold market had peaked, SocGen acclaimed the end of the gold era was upon us, and recently Goldman Sachs told everyone to short the metal. The big father George Soros sold down his GLD position by about 55% as of the end of 2012 and had just 600,000 shares remaining. Well this "smartest guy in the room" locking in a profit after a 12 year bull market. Well the gold price fall was something beyond creativity. The following instances would make my testimony and research very productive. 1. The gold futures markets opened in New York on Friday 12th April to a monumental 3.4 million ounces (100 tonnes) of gold selling of the June futures contract (see below) in what proved to be only an opening shot. 2. Two hours later the initial selling rumored to have been routed through Merrill Lynch's hit the market by a further 10 million ounces of selling (300 tonnes) over the following 30 minutes of trading. Naked short selling of gold contracts that occurred on January 6, 2014: more than 12,000 contracts traded – equal to more than 10% of the day’s entire volume during the 23 hour trading period in which gold futures trade. No news to support the same. At the same time, no other securities market (other than silver) experienced any unusual price or volume movement. 12,000 contracts represents 1.2 million ounces of gold, an amount that exceeds by a factor of three the total amount of gold in Comex vaults that could be delivered to the buyers of these contracts. Well the above points are sufficient enough to proof the story that US is buy in buying Gold at low prices. US don’t like China for its policy of converting and shifting its Dollar reserves to Gold. But it can’t take any wild action with china since majority of US manufacturing base is in China. Now when the Gold Prices would increase depends less of demand and supply and more on QE since if there is any QE required in Future then price of Gold Have to increase so that valuation of the same and equivalent amount of dollar is printed. The London Bullion Marketing Association (LBMA) physical gold market plays a pivotal role in Gold Market. The LBMA is comprised of several large bullion banks who make a market in physical gold. The reason behind asking India to curb gold import is that US fears that their dollar might be replaced and diversification of investments from dollar to Gold-this will replace dollar as the reserve currency. Well a currency with high fiscal deficit would be risky for trade in the next 6 years from now hence every economy would try to save himself. Further in my research and in continuation to my previous article I find that US will replace the entire middle east from crude protection by 2020 since by that time US deficit would create havoc pressure on the dollar which will force many economies to stop using dollar as the currency and in order to protect the green back crude production and trade is the best option.So enjoy the low price of crude till then. We all have been busy to figure to out why US is seeking desperately for no more QE and hike the interest rates. US have no more buyers of its treasuries. This is the biggest reason why US wants to get out of QE. Moreover the rate of interest being demanded and not asked by the Treasury holders is killing the US economic growth over the next 10 years from now. The most surprising part would be in the coming decade that Dollar would loose the World Reserve Currency tag line. Countries like Iran, Russia, China and Brazil have become increasingly concerned that the value of their T Bond holdings are being diluted by the Fed’s massive money printing campaign. Even they have started taking efforts to avoid Dollar as trading currency. Recently, Russia and China signed a 30 year gas deal that supposedly does not involve dollars for payment. We all know that China have been the king of the US treasuries but over the past 1 year it kept it level at the same. China’s holdings of US Treasuries dropped to the lowest levels in two years after China dumped $47.8 billion in paper—equal to about 3.6% of its Treasury holdings as of November—bringing its total holdings to $1.27 trillion. Russia has also reduced its holdings and many of them will try to add political colors for the same but the reality is that US dollar is being abandoned. 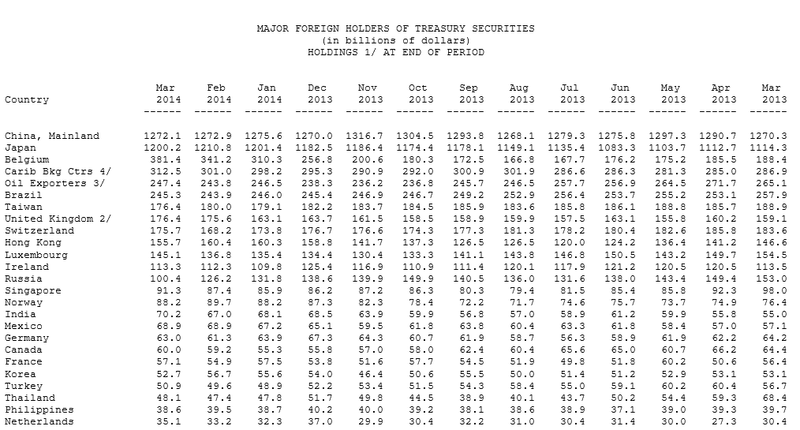 Astonishing I find that Belgium becomes the hot country in term of increasing it US treasuries holdings. Belgium held $188 billion of T Bonds in March 2013, $200 billion in November 2013, $257 billion in December of 2013 and $381 billion by March of 2014. Belgium the name might have surprised but the truth is that US is trying hard to get the Euro to live even we all know that the European economy and its Euro-zone states are in deep trouble. 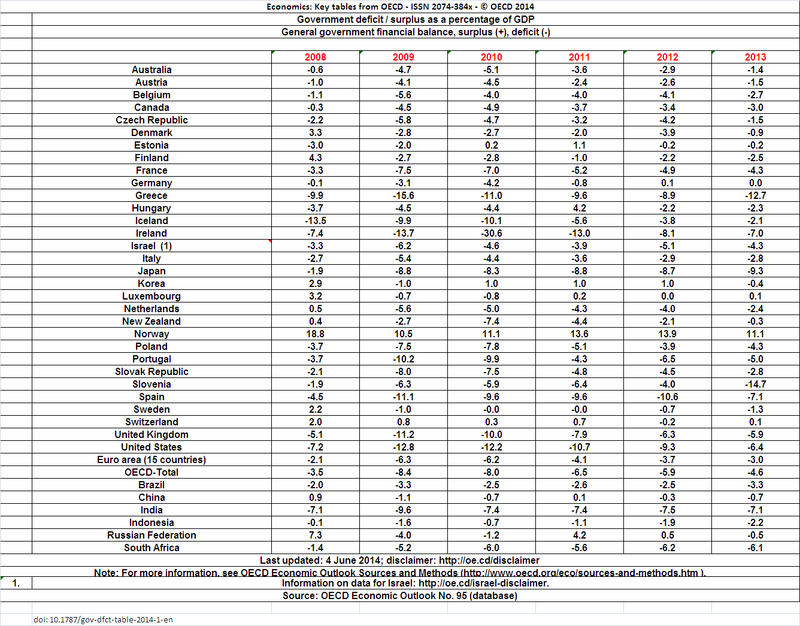 Belgium don’t have the funds in its pockets moreover they don’t have a surplus in their budget. Their budget deficit is in the red, and their trade and current accounts are in the same colors. US treasuries were being offloaded in large quantities and this was creating a panic among the other investors. Hence they introduced the funds through Belgium and showing the world that they are buying it. This is the main reason behind winding up of the Treasury sales and using allusive jargon to fool the economy and the world that US economy is coming out of the recession and economic activities are improving. They even did not get buyers for the US treasuries and hence they took the decision of gradual winding up. The Big cats are more focused towards the dollar rather than the high unemployment levels of 50% in some euro-zone countries. The Fed now holds nearly $2.4 trillion T-Bonds, or about two times as many as China. Dollar deals are getting low and this is visible form the last year data that as on May 2013, the percentage of foreign exchange transactions conducted in dollars was 80% and the percentage of overseas reserves held in dollars was 60%. As countries sign more non dollar deals among themselves and diversify their reserves, these percentages will certainly fall. U.S Treasuries and bond buying is being executed through the large European banks which have U.S. subsidiaries. On a consolidated basis, non-US banks raised dollars by swapping other currencies and increasing dollar liabilities, even as they increased dollar claims outside the United States. 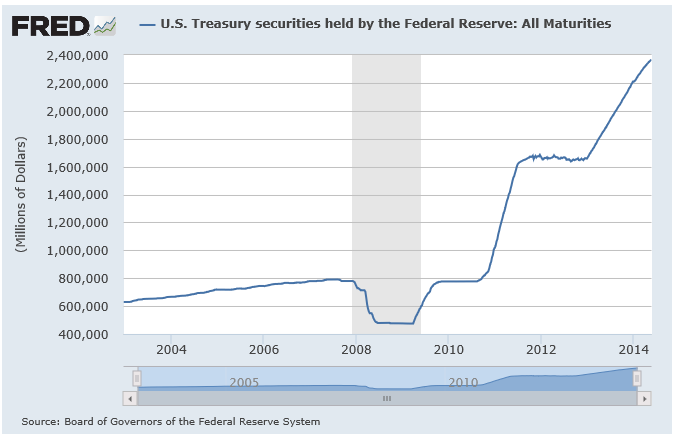 The below chart depicts the US treasury holdings. Now as there are no buyers of the Treasuries in the near future and also the level of interest being demanded against them gives negligible position to the US government in the near future to revive or protect the economy from further collapse. US dollar is dumped and avoided by many economies and this gives significant threat to the US dollar and economy as with a huge deficit on its back it will be in a negligible position to bargain or command the green back. This is also one of the angles of looking towards why the US is desperately looking forward to become one of the top producers of crude replacing the Middle East. If US are able become the top leader of crude production and natural gases then its Dollar will remain as Trading /Reserve Currency. This is the prime reason behind US aggressively moving ahead towards crude production and it has no other option than to replace Middle East. But recession will begin as US economy is still far behind recovery (well apart from the rosy picture of US FED Head). Employment and inflation are just opposite of what we are reading and assets bubbles are going to burst which will lead US economy to begin recession for the world economy. 2016-2020 we will witness one of the biggest recession and that would collapse the global economy. Well for a common man employment is the key factor which gets affected in Recession. During 2016-2018 the Interest rates of US would rise and we must be prepared for the reversal of the inflow of capital from the emerging economies like India. Currently Equity markets across the globe are in the zone of all time highs based on QE injected steroids followed with Zero Interest rates. We all know that what has happened when only the words of interest rates hike was being uttered by the US FED during 2013 mid. Its QE has failed to bring growth within the macro economy of the US. We are not taking the Dowjones and the S&P 500 company’s growth as macro economic growth since there is a wide divergence between the economic growth and S&P 500 companies. The main headache going forward is the burst of the bubbles from various industries which will create a Tsunami affect on the global equity markets. The question is why US and the global economy will be under threat when the interest rates starts increasing. We are here to find the answerer in simple terms. Moreover we are finding here the rationales behind why US wants to raise interest rates despite of anticipated problems. Current Zero Interest and QE affect on Industries…don’t be fooled. 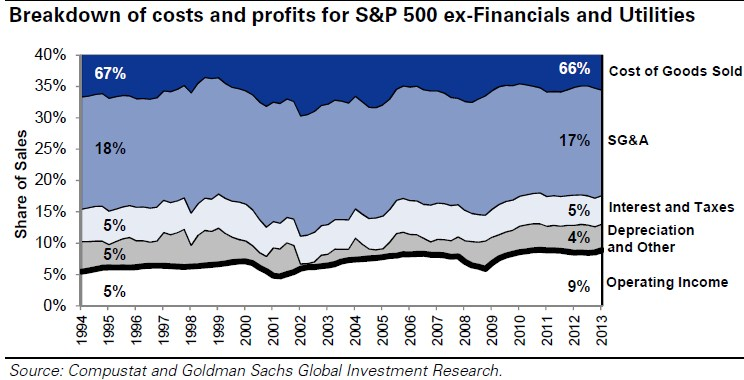 Corporate profitability is currently at record levels in US. Operating margins equaled 8.9% at the end of 2013, a return to the previous peak. Big companies have taken the opportunity to borrow in the bond markets, locking in cheap financing for years to come. We are taking the numbers of new home sales to be positive and showing signs of recovery of the US economy. Well that’s another fool’s paradise of statistical numbers. A lower mortgage rate puts money into homeowners’ pockets when they refinance their loans (mortgage origination jumped by 39% to $1.75 trillion last year). It also encourages people to move. Existing-home sales were 4.66m last year, according to the National Association of Realtors. I hope we are clear now about how much strength this growth has in real terms. Ones interest rates starts climbing a little every numbers will vanish. Zero rate of interest has pushed up the automobile consumption but that’s a borrowed or refinanced. Americans took out 19.9m car loans worth $388 billion in the first 11 months of 2012; both figures were six-year highs. Total American car sales rose by 13.4% to 14.8m last year, the highest total since 2007. But all these are not stable economic growth. The are all inflated and all borrowed capital game and no real investments. The history of the global economy has number of cases where prolonged zero interest has been a birth of crisis. In Thailand in the mid-1990s a property boom fuelled by cheap dollar loans ended in devaluation and disaster. In Spain and Ireland in the early 2000s cheap euro-denominated loans resulted in another property bubble. Now come to the story of manufacturing excluding financial and utilities. Margins have improved over the last four years. Margins for S&P 500 (INDEXSP:.INX) companies (ex-financials and utilities) dropped to 5.9% during the financial crisis in 2009. Just a year and change later in the third quarter of 2010, margins had already returned to the earlier 2Q 2007 peak of 8.3%. Margins continued to increase over the next 12 months, eventually reaching an historical peak of 8.9% in third quarter 2011. Taxes and interest rates have never been more favorable for the profitability of US firms. Technology-created productivity increases and relatively low labor and commodity costs as factors in higher corporate margins. “S&P 500 companies lowered both cost of goods sold and selling, general & administrative expenses as a share of revenue. Further don’t be fooled with the corporate profit growth of US or European companies as most of them are hollow. Low rates have given another ammunition in the hands of the US and European corporate to allow firms to substitute debt for equity. This usually boosts earnings per share, which makes it an attractive choice. American companies spent around $400 billion last year buying back their own shares, the equivalent of 2.6% of GDP. British ones spent 3.1% of GDP the same way. The trend has continued in 2013 and 14 too. By march 2013 last year , $111.6 billion of American share buy-back programmes had been announced, a 96% increase on the same period in the previous year. As on September 2014 over the past 12 months American firms have bought more than $500 billion of their own shares, close to a record amount. Now why capital investments did not happen and where the funds of QE and Zero interest rates went is clear. The companies in the S&P 500 index bought $500 billion of their own shares in 2013, close to the high reached in the bubble year of 2007, and eating up 33 cents of every dollar of cashflow. The Zero Interest rates play the game like this: When it buys its shares or pays a dividend, a firm is transferring cash to its owners. It does not alter the underlying value of the firm, which is determined by its expected cash flows and their riskiness. Instead all that happens is that the financial instruments with a claim on those cash flows are reshuffled: the value of the firm’s equity declines, its cash falls (or debt rises) and investors’ cash holdings rise, all by an identical sum. In both cases, owners’ wealth is also unaffected: those who sell shares in a buy-back end up with more cash and fewer shares. These corporate have paid less tax since interest paid on debt is tax-deductible, whereas interest earned on cash is taxable, by increasing its net debt to finance buy-backs or dividends, a firm cuts its tax bill. And of course, increasing the firm’s indebtedness makes it riskier. This is one of the best uses of Zero Interest rates regime. The government has failed in both terms 1) poor macroeconomic investments 2) negligible corporate tax revenues. Buy-backs gave a superficial boost to EPS: the number of shares falls more than the decline in profits from higher interest costs. So don’t be fooled with the US stocks performances. Sluggish investment despite low interest rates, and huge share repurchases, is broadly true of all of corporate America and this has taken a devils shape which will become active once the rate of interest rates start increasing. History says that repurchases by firms in the open market, the main type of buy-backs today, used to be banned. America loosened its rules in 1982, Japan in 1994 and Germany in 1998. But the criticism seems excessive, given how similar buy-backs are to dividends. On the other hand the non-financial firms in the S&P 500 index last year took great advantages of Zero interest rates by extending the maturity of their debts. 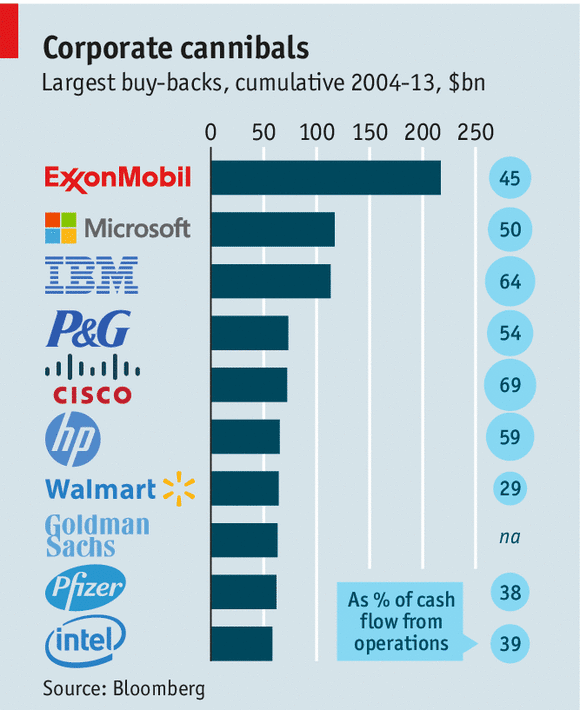 Their books roughly balanced: buy-backs, dividends and capital investment ate up 101% of operating cashflow. Their net debt was modest and stable relative to gross operating profits. These are all the reasons why US wants to increase the interest rates since it knows that real benefit to the economy has be Zero. It wants to cut down these game and make the economy strengthen despite of some pains in the long term. Be prepared for the fall and be wise while doing investments. Stop taking cues from the US markets to plan your vision for investments. Another Financial Crisis is in the wings. Within 2016-2020 we will witness one of the historic Financial Crisis in the coming days as burgling QE and Fiscal deficit followed with weak inflation. When QE came into the streets during 2008 every economy thought that this will spook inflation and will get the consumers back into the streets with the attitude of borrowed living. But it failed but also damaged the scope of further QE. We have now come to the end of QE as US is withdrawing but how much effective it would be withdraw is a trillion dollar thought. The biggest blow would come when the ammunition of QE will come to an end. All the QE across the globe has suppressed long-term interest rates in order to get businesses to refinance debt and invest consumers to refinance debt and buy houses, and the government to refinance debt and spend. Well assets classes reacted well to the same and the Big Giants of the Global market made billions again but now the time of loosing is about to begin. The below picture depicts the story of the Journey of US FED QE and its inflows. Remember that Emerging market countries are among the most exposed to a reduction or reversal of financial flows given that they were the recipients of large amounts of capital inflows during the quantitative easing period. India has been one of the prominent receivers of the same and also I find that the current government and its strategies by Honorable Prime Minister Narendra Modi is well researched. His invitation for investments is to the NRI’s and to the corporate to start developing their manufacturing base in India. We are not asking for inflow of capital through stock market or through the FII’s route. In the same note RBI governor is also cautious in its interest rates policies since if their si global crisis of liquidity in the system then interest rates reduction would act as the correct medicine during that time. 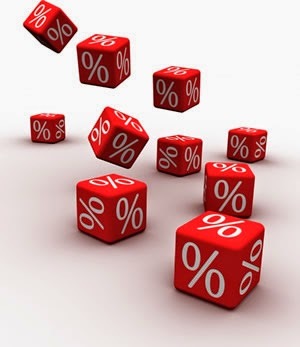 Reducing interest rates now would create bubbles and more NPA. Reversal in the inflows would create ripple effects and on all asset classes. Well Asset prices has swelled as current liabilities of the countries of QE has increased hence much of the QE went into investments and safe guard the current liabilities payments. 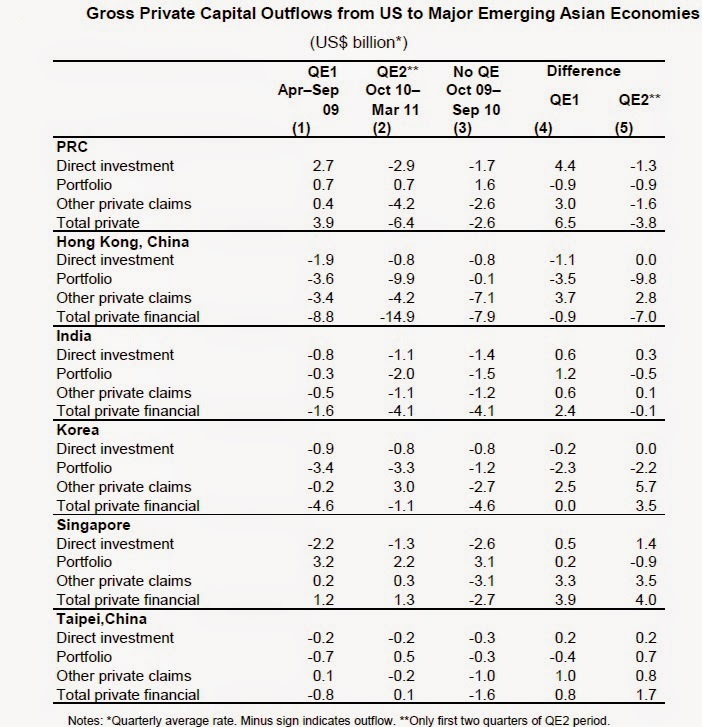 The below picture is related to the inflow of capital of QE into emerging economies. Pumping of money into the system has become one of the best mechanisms to face the problems of declining economic growth. After China and US stimulus packages now the turns has arrived for the European economy to pump steroids of QE into the system. ECB unveiled details of its purchases of assets-backed securities and covered bonds, scheduled to commence from mid-October. The biggest question among all these is that how long the QE and Rising Debt would keep the world economy alive. Global QE from China to US has lead Share prices tripled since the March 2009 low, as measured by the S&P 500 index, and are now richly valued. Now how the Financial Crisis would begin and why QE will be coming to end. Substantial decline in savings rates -inflation-adjusted wealth of America’s median household – half of households are above and half are below – plunged 36% from 2003 to 2013. Citizens of these countries are skeptical regarding how much the government would be able to pay the retirements and other social payments and secondly if in the future the government withdraws any of the policies then where they will get their retirement resources etc. This has pushed the back the appetite of borrowed living consumption. The current inflation levels are indicating that we are all living in the time of 1950-70. The bulging liabilities of US is going to be biggest threat and also is the biggest rationales behind skeptical citizens outlook of US. I find that within the next 10 years emerging economies would find shifting of funds and production capacities in their economies from developed economies as devaluation of currency and low cost of production would be the trigger. India is going to be one of the key benefit er of the same. All asset classes’ prices have increased from real estate to equities creating new heights. Pumping of funds into the system has propelled the valuation and investments but zero benefits came to the economies. From China to US all asset classes of these economies have created new historic highs. Since January 2009, the Fed has purchased about $900 billion of mortgage-backed securities, $90 billion of agency securities, and $1.17 trillion of Treasury securities, for a total of about $2.2 trillion. This represents about 28% of the outstanding amount of these securities, a huge amount. The next level of game which will be played by the world leaders of these QE countries is to play with the currency. They will try their bets to devalue the currency and Japan is clearly in the process of weakening their currency. ECB head Mario Draghi is committed to weakening the euro. The reigning economic philosophy has it that weakening your currency will boost exports and thus growth. And Europe desperately needs growth. This is the best ammunition to get growth within the economy and increase exports which leads growth for the industry but this would impact trade practices and would destroy the emerging economies true potentiality. The world economy would face tremendous increase in trade practices violations. India has taken the right step by asking the NRI community to come back to India and explode opportunities here since the developed economies are going to face one of the toughest days. Low cost of production economies are being searched now and the competition would increase further. The biggest collapse would come once the entire ocean of QE will dry up and then intricate investments across the globe would squeeze the liquidity and all asset classes would start the biggest fall. Over 90 percent of Japanese banks have increased loans and investment in riskier assets in the past year. Emerging economies growth is also going to take a hit and hence the world economy would enter into another round of recession by 2016-20.The above rationales are enough to prove the theory that reversal of capital and insufficient macro –economic growth are going to be biggest bubble. The debt market will be rattled and the currency will turn out to be the highest volatile precut every in the history of financial products in the coming days.